English Premier League side Fulham Football Club today unveiled their 140th Anniversary kit from technical sponsor adidas. The new Cottagers jersey was revealed by FFC at the site of their founding in 1879 – Fulham St. Andrew’s Church. Limited to 1,879 individually numbered shirts, the Fulham 140th Anniversary kit features halves inspired by the club’s first home kit. While the initial shirt was in two shades of blue the commemorative jersey is in the familiar black and white that Fulham adopted in 1889 and has retained in a number of forms since. The latest addition to Fulham’s match range uses a new crewneck soccer jersey design from adidas. The brand’s three stripes run along the shoulders. “140 YEARS” is printed beneath a black and white version of the Fulham FC crest. “ESTD. 1879” adds detail to the fully black back of the kit. Fulham FC will wear their 140th Anniverary adidas kit during their 2019/20 pre-season campaign this summer. 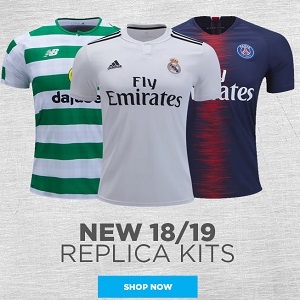 Check out Latest Kits section for more of the newest jerseys around today. Follow Football Fashion on Facebook, Instagram and Twitter for real-time notifications of new soccer jerseys and much more!